You've asked some great questions about how to make a baby sling. I hope you find these topics helpful. If you have any other questions, please don't hesitate to Ask Addie. Measuring for a sling while you're pregnant. My sling turned out too small. I am pregnant right now and you may have already answered this questions somewhere in the instructions and with my prego mind I have overlooked it. I thought I read somewhere before that you can measure from should to hip across your back when your pregnant. Do you recommend that and if so how much should you add to allow for bust? Any thoughts? :) Thanks by the way for taking the time to put these instructions together. They are very user friendly! tried it in my current, non-pregnant state. On me, the measurement is the same front or back. But bustiness doesn't run in my family. And that is A major understatement (pun intended). so much that I'm afraid to offer instructions to make a baby sling that might work for one but not for another. If it were me, I would do an across the front measurement, taking in the bust measurement but trying to bypass the belly as much as possible. Then measure from the back and see if it's close. Then I would either average the two, or go for the larger size. For me, larger is better when my milk comes in. :) If you discover that the sling is a bit too long or loose feeling, then you can always cut it along the french felled seam. Cut off the old seam, and take it in a bit with a new seam. You definitely want it to hold baby snugly to you, and not swing out from your body as you move. Congrats and best wishes on your little one! I tried to make a baby sling using your standard measurements since I was too pregnant to take a custom measurement. (It didn't occur to me to measure my back instead.) Anyway, I made the medium size since I wear small or medium clothing. To my utter dismay, the sling is much too small. It barely fits me and certainly doesn't allow for a baby. Just thought you'd like to know. Maybe I'll try again someday. Thank you for the pattern. too large with the numbers. When you make a baby sling, you don't want the baby swinging out from the body when you bend...too big is just too dangerous. 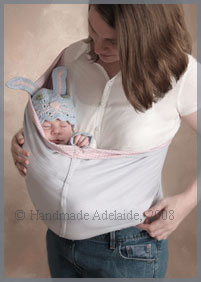 Baby slings are supposed to be pretty snug, as the baby is supposed to be held snugly to the body. suggestions and feedback very much. The home decor fabric --- It says dry clean only. That doesn't seem good for something for a baby. And where do you get it with a little stretch to it? I agree about the dry cleaning…I prefer easy care, no-iron fabrics when I make a baby sling. I personally would not use dry clean only fabric to make a baby sling...unless the fabric is 100% cotton. If that’s the case, I might try test washing it on the grounds that the company is marketing it for home decor uses, and may only suggest dry cleaning to keep from shrinkage/fading issues with upholstery etc. I would try test washing a swatch and see if it works for you. If it's a fabric that you really like, you can get a swatch, get a color copy or scan made of it, or just trace the exact size of the swatch on paper. Then wash/dry as you normally would for 100% cotton material. When I wash fabrics that I’m going to use for baby items, I like to use Dreft of another gentle and dreamy smelling baby detergent. You can check for shrinkage and fading on your washed swatch of fabric, comparing it to the tracing. I have personally made washable items out of home decor fabric, so I know it works with some of them. However, without seeing your fabric...it's hard for me to say. stretch are easier to find in the fall (suiting, denim, etc.). The home decor fabrics probably won’t have any stretch to them. I usually just like the prints they carry, but not all are suitable to make a baby sling. Hope you find something great!